This October the Golden Circle luncheon will be at the Longfellow House located in the Historic District of Cape May, NJ. The house will be open to anyone who would like to come Friday night and/or Saturday night. Alix simply asks that anyone reserving a room pay $35 (per person) for their entire stay. The Longfellow Guest House will be open first thing Friday morning for anyone wanting an early start to the weekend and anyone staying until Sunday can stay late into Sunday afternoon to better enjoy the weekend getaway. Be sure to check out this website for additional information regarding the house including location, directions to house and many of the Common questions can be found at this FAQ's Link. Create the weekend you want. Details are still to be worked out. Much depends what you as Golden Circle Members would like to do but last time we had a morning session, a break for lunch, and then an early afternoon session Saturday. If some choose to make a weekend of it, we could have an optional session early Sunday. FYI: Annie is asking for a $25 Food & Snacks fee so that we can provide basic breakfast foods and snacks, as well as a lunch to be provided on Saturday.The dinners on Fri & Sat are on your own. Anyone who wanted to stay for any part of the weekend would be free to enjoy Cape May. The "other" meetings do not have to be formalized they can simply be casual or formal depending on what everyone would like to do. Please contact Annie at Office Phone: (610) 701-5692, Cell Phone: (484) 250-9921 or email annieland62@msn.com if you have ideas or suggestions. Friday is for arriving and getting settled in. 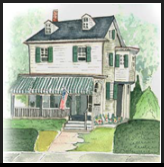 The house will be open in the morning if you choose to come into Cape May early. Annie would like to gather around 8 pm for a time of introductions, housekeeping, getting acquainted, etc. 12:30 - 2 Session 2 - topic being finalized short break for stretching, phone calls, etc. “Digital GTD – using digital tools with Getting Things Done Methodologies” such as David Allen’s process, Steven Covey’s Four Quadrants, LEAN Office methods, and Agile methods. Dinners on Friday & Saturday are on your own. There is a lot to do in Cape May. Sunday breakfast will be around 9 am and you can leave whenever it suits you. Here are some links to some of the restaurants around town - please note that some of these may have closed for the season but just ask Alix if you are looking for something special to do and want some suggestions. Bedrooms are available on a first come first serve basis. Click to see gallery of bedrooms and if needed there is a queen size pull out couch in living room. We have a super convenient in-room linen service, providing fresh linens delivered right to your room! Just let me know if you want me to provide linen set includes: sheet/pillow cases, wash cloth, hand towel, bath towel. $10 per set for the weekend. We know Cape May really well, and we know what's important to our guests. So when we have have a fun new discovery to share, we'll typically announce it first on our email newsletter (and we'll announce Longfellow House rental specials). Contact Alix by clicking Golden Circle Weekend in Cape May. Please indicate your preferred bedroom (Queen, Full, Twin, etc.) and night(s) you would like to stay. The rooms are on a first come first serve basis and as rooms are reserved updates will be posted on this website page.